People are often unaware of the massive cost savings through energy efficiency initiatives – despite seeing big increases in their energy bills. 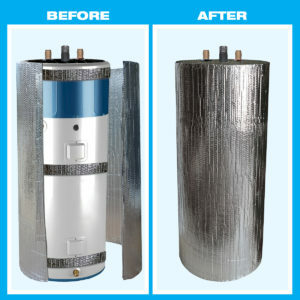 Heating domestic hot water is the second largest energy consumption in a household next to heating and cooling air. Independent research has shown that insulating hot water tanks with a radiant barrier will save up to 14% of the energy consumption. The end consumer will receive an average payback of only four to twelve months. Reflecto-Foil™ is a Reflective Foil Insulation that is placed in an air space to block Radiant Heat Transfer between a heat radiating surface and a heat absorbing surface. The Reflecto-Foil™ insulation acts as a Radiant barrier, which can stop up to 97% of heat loss from being transferred, which saves excessive amounts of energy consumption. and DIY KITS of Energy Efficient Products"
Copyright © 2019 Ecoshades. All Rights Reserved.